You can also take a lead on what you love with one of our voluntary positions as a Student Leader. You will be responsible for representing specific groups within Union Southampton and work with our Sabbatical Officers to help ensure that our students experience at the union is the best it can be! 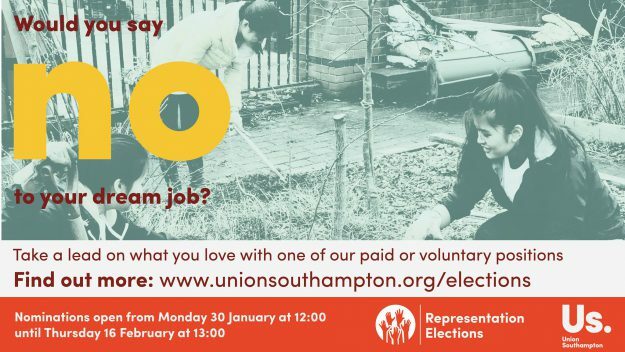 To find out more about these positions, and a chance to nominate yourself, go to www.unionsouthampton.org/elections. You can also recommend a friend who you think is passionate about the student experience and would be interested in a role by letting us know here and we will get in touch with them. Remember, you only have just over 2 weeks to get your nominations in, don’t miss out!